I grew up listening to classic rock. Going back as far as I can remember, there was classic rock coming out of my dad’s oversize speakers that my sister and I liked to poke holes in as kids. From The Alan Parsons Project, to Journey, Boston, Dire Straits, Men at Work, and even some Frankie Goes to Hollywood, one band especially stood out: Electric Light Orchestra, or E.L.O. E.L.O. has always had a special place in my memory bank; can’t quite explain it, but it’s been with me for at least the past 20 years. When E.L.O. 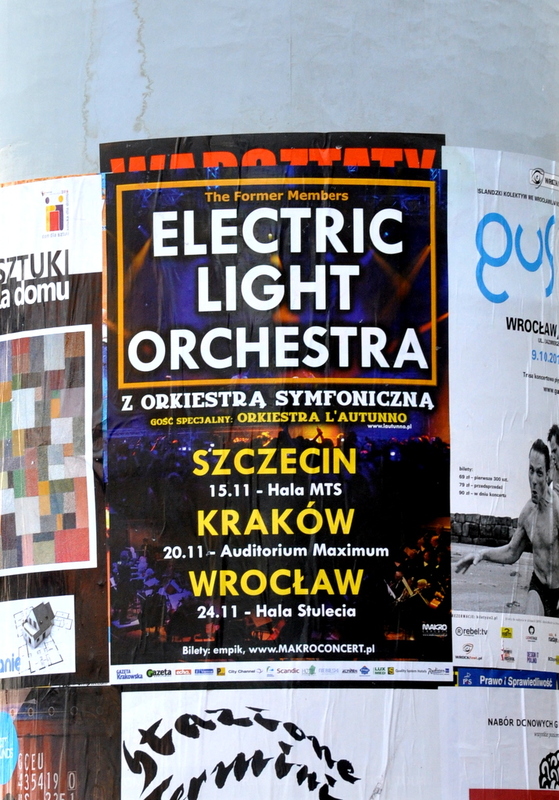 Part II played a concert in Wrocław sometime in the early 90’s I watched it on the television while recording the concert on a cassette tape. As a kid I was also convinced that one of the bands members was Polish judging purely by the persons name, but with a name like Mik Kaminski c’mon, as Polish as it gets. I still don’t know if there’s any truth to that. Today I have all of their albums, even the stuff I would call experimental at best. There are two E.L.O. CD’s currently playing in my car, my iPod has a few albums ready at all times, and even though I don’t own a turn table I have six E.L.O. records at my home back in Los Angeles. The reason I’m writing all of this is simple: E.L.O. is coming to Wrocław! The former E.L.O. members, with no Jeff Lynne in sight. Some say E.L.O. without Jeff Lynne is like Queen without Freddy Mercury, but to me the music is all that matters and Jeff Lynne or not I’m sure it’s going to be a great concert. Tomorrow’s payday… so it’s time to look for some tickets. I know what you mean. I grew up with E.L.O. too. I don’t think it ever escapes you. Every time I hear a song I think of the weekends where my dad would play it.